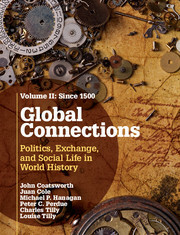 I and colleagues have just brought out a world history. Because of the fine and exciting writing of my co-authors, it is more than just a textbook. My readers often ask me about history books – here’s one I can recommend. The first comprehensive survey to present world history via social history, drawing on social science methods and research. This interdisciplinary, comprehensive and comparative book is authored by distinguished scholars and experienced teachers, and offers expert scholarship on global history. Volume 1 takes us from the origin of hominids to ancient civilizations, the rise of empires, and the Middle Ages. The book pays particular attention to the ways in which ordinary people lived through the great changes of their times, and how everyday experience connects to great political events and the commercial exchanges of an interconnected world. With 65 maps, 45 illustrations, timelines, boxes, and primary source extracts, the book moves students easily from particular historical incidents to broader perspectives, enabling them to use historical material and social science methodologies to analyze the events of the past, present and future. Introduction; Part I. 5000–600 BCE: The Rise of Cities, States and Pastoralism: 1. From human origins to the farming transformation; 2. Cities and states; 3. People on the move; Part II. 600 BCE–600 CE: A World of Regions: 4. Africa and the Americas: making history in challenging environments; 5. East, Central and South Asia: the religious foundations of empires; 6. The Ancient Mediterranean; Part III. 600–900 CE: States, Empires, and Religions: 7. The Middle East and Europe; 8. The heyday of the Silk Road; 9. The rise and fall of states in the Americas and Africa, 600–1200 CE; Part IV. 900–1200 CE: Fragmentation, Feudalism, and Urbanization: 10. Europe and the Muslim World; 11. Paradoxes of plenty in Song China, Byzantium, and Kievan Russia; Part V. 1200–1500 CE: Conquest and Commerce: 12. The Americas and Africa; 13. The Mongol Conquests and their legacies; 14. Europe and the world. Volume 2 takes us from the early modern period to speculation about the world in 2050, visiting diverse civilizations, nation-states, ecologies, and people along the journey through time and place. The book pays particular attention to the ways in which ordinary people lived through the great changes of their times, and how everyday experience connects to great political events and the commercial exchanges of an interconnected world. With 75 maps, 65 illustrations, timelines, boxes, and primary source extracts, the book enables students to use historical material and social science methodologies to analyze the events of the past, present, and future. Introduction to Volume 2; Part VI. 1500–1700: The Early Modern World: 1. New empires in Asia and the Middle East; 2. Russia, Central Eurasia, China, Japan: centralization and commercialization; 3. The Americas and Africa in the era of conquest and enslavement; 4. Crossroads on the edges of Eurasia: Europe and Southeast Asia, 1500–1800; Part VII. 1700–1850: Revolution and Reform: 5. Expansion, reform, and communication in the agrarian empires of Asia; 6. The first industrial revolution and the origins of international inequality; 7. The age of revolution; Part VIII. 1850–1914: Energy and Empire: 8. The second industrial revolution; 9. States and social movements; 10. Nationalism and anti-colonialism; Part IX. 1914–50: Wars and Revolution: 11. The Great War and world revolutions, 1914–21; 12. Twentieth-century social revolutions, 1922–39; 13. World War II and the collapse of empires, 1931–50; Part X. 1950–2000: Global Threats and Promises: 14. Cold wars and hot wars: economic boom and slowdown, 1950–85; 15. Decolonization; 16. Global connections and disturbances, 1980 onwards; Conclusion. John Coatsworth is Professor of History and Provost of Columbia University and former Dean of Columbia’s School of International and Public Affairs. He is author, editor or co-editor of nine books on Latin American economic and international history, including The Cambridge Economic History of Latin America (2006) and Living Standards in Latin American History (2010). He has taught undergraduate and graduate courses in comparative and Latin American history at Columbia since 2006. He previously served at Harvard University and the University of Chicago. Other academic posts have included visiting professorships at El Colegio de México, the National Autonomous University of Mexico, the National University of Buenos Aires, the Instituto Torcuato di Tella in Buenos Aires, and the Instituto Ortega y Gassett in Madrid. He is past president of the American Historical Association, and a member of the American Academy of Arts and Sciences and the Council on Foreign Relations. Juan Cole received his doctorate in Islamic Studies from the University of California, Los Angeles, in 1984. Since then, he has taught history at the University of Michigan. His monographs have treated the Shiite clergy in South Asia, anti-colonial revolution in Egypt, millenarianism in modern Iran, transnational Shiite thought and movements, Napoleon Bonaparte’s invasion of Egypt, and the US engagement with the Muslim world. After September 11, he emerged as a public intellectual, with frequent appearances on television and radio and popular columns at Salon and Truthdig. His weblog, Informed Comment, receives a wide readership from those interested in the Western relationship to the Muslim world. Michael Hanagan has taught at Vanderbilt and Columbia Universities and has long experience in teaching undergraduate history. He currently teaches courses in world history, global history and international studies at Vassar College. He is the author of several books, including The Logic of Solidarity and Nascent Proletarians. He has edited a number of collections. Most recently he edited (with Chris Tilly) Contention and Trust in Cities and States. He is also finishing a manuscript with Miriam Cohen on the comparative history of the welfare state in England, France and the United States between 1870 and 1950. He served as senior editor for the journal International Labor and Working-Class History for four years, has been on the Consulting Board of Theory and Society for the last seven. He is currently a co-editor of the series Cambridge Studies in Contentious Politics. He is currently working on an essay on world history for the UNESCO Encyclopedia of Life Support Systems. Peter C. Perdue has over thirty years of experience teaching undergraduates about Asian history, at Harvard University, the Massachusetts Institute of Technology and Yale University. He has also lectured to general audiences in Europe, China, Taiwan, Singapore, Japan and many places in the USA. He has taught surveys of East Asia, modern China, environmental and frontier history, and visual history, along with specialized seminars on Chinese documents, and comparative and global history. His prize-winning book, China Marches West: The Qing Conquest of Central Eurasia, examined the expansion of the Chinese empire into Mongolia, Xinjiang, and Tibet over the two centuries from 1600 to 1800. Exhausting the Earth: State and Peasant in Hunan, 1500–1850 described environmental change over the long term in one province of imperial China. The materials he prepared for the website on the Canton trade (visualizingcultures.mit.edu) won the Franklin Buchanan award for curricular development from the Association of Asian Studies. He has published many articles and conference volumes on comparative empires and frontier history, and has collaborated with engineers, natural scientists, anthropologists and economists in several research projects. He is an elected member of the American Academy of Arts and Sciences and an Honorary Visiting Professor at People’s University, Beijing, and Fudan University, Shanghai. Charles Tilly (1929–2008) held faculty appointments at the Universities of Delaware, Harvard, Toronto and Michigan, and the New School University, and finished his career as the Joseph L. Buttenwieser Professor of Social Science at Columbia University. His over 50 books and monographs cover a wide terrain but from his first historical work, The Vendée (1964), to his last uncompleted manuscript, Cities in World History, his work focused on large-scale social change and its relationship to contentious politics, (especially in Europe since 1500). His writings deal with the history of contention but also with urban history and the study of historical migration patterns. His principal works include: The Contentious French (1986), Coercion, Capital, and European States, AD 990–1990 (1990), European Revolutions 1492–1992 (1993), Cities and the Rise of States in Europe, AD 1000–1800 (1994), Contention in Great Britain 1758–1834 (1995), and Contentious Performances (2008). A member of the National Academy of Sciences, the American Academy of Arts and Sciences, the American Philosophical Society, and the Ordre des Palmes Académiques, he received numerous international prizes and honorary degrees. Louise A. Tilly is Emeritus Professor at the New School University where she was Michael E. Gellert Professor of History and Sociology in the Graduate Faculty. She was chair of the Women’s Studies department at the University of Michigan and chair of the Committee on Historical Studies of the New School University. In 1993 she served as president of the American Historical Association (AHA). She is the author of Politics and Class in Milan, 1881–1901. With Joan Scott she is the co-author of Women, Work and Family, a classic in the history of women’s labor, and, with Charles and Richard Tilly, the co-author of The Rebellious Century, 1830–1930. She is the editor of books on a great variety of topics including the European fertility decline, the European Union and women’s employment.